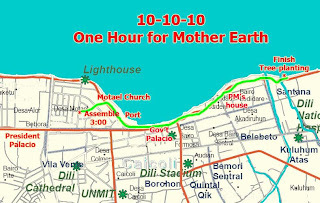 from 3 pm to 4 pm OTL on Sunday 10-10-2010. We are a new movement calling for climate justice which will do a march and plant hundreds of mangrove trees on the seacoast in Bidau Santana, Dili. With deepest consideration on the risk of climate change to Timor-Leste, and to share with other colleagues on this day of global campaigning to limit the world carbon emissions to reduce the global atmospheric concentration to 350 ppm as recommended by the Intergovernmental Panel on Climate Change. Together we can make a difference and ANOTHER WORLD IS POSSIBLE WITH CLIMATE JUSTICE. On Sunday, 10/10/2010, thousands of actions all over the world will celebrate the international campaign to reduce greenhouse gas emissions to save our planet. 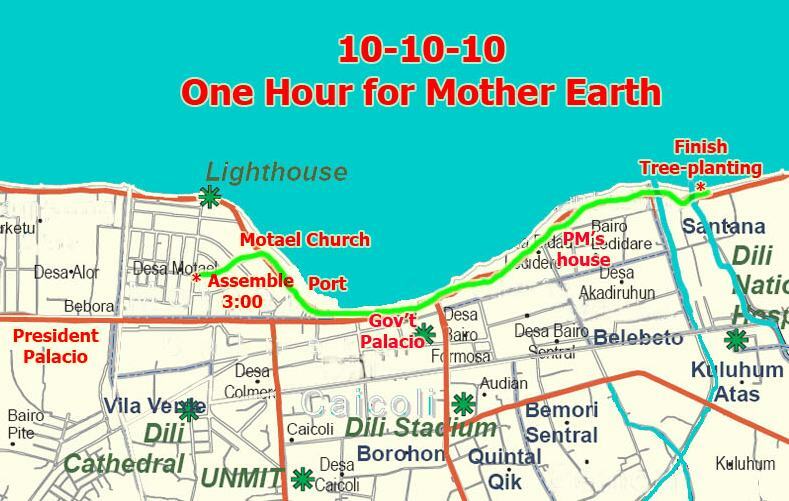 In Timor-Leste, an organizing committee is asking religious, government and other leaders, as well as the entire population of Dili, to take part in this campaign with a concrete action: stop all fossil-fuel-based transport in Dili from 3:00 pm to 4:00 pm Timor-Leste time on Sunday, 10 October 2010. This concrete action will show the world that Timor-Leste is in solidarity with people worldwide in our common campaign on that day to limit greenhouse gas emissions. Our declaration follows below. In addition, people will gather at 3:00 pm at the intersection next to Farol Primary School (across from Hasatil) to walk to the mouth of the river in Bidau Santana to plant mangrove trees, and we welcome everyone to join us.